I've always thought there was quite a bit of true magical insight in Terry Pratchett's portraying of witchcraft. Yesterday I made a shamble following instructions at an exhibition at the Maidstone Museum - Paul Kidby: Discworld and Beyond. Paul Kidby was the illustrator of Terry’s Discworld books. Much of the exhibition shows his illustrations for the novels - which are gorgeous and also heavily influenced by British folklore. However, my favourite part was a shamble tree (pictured right) - and anyone who goes there can learn how to make one to add to the display. A shamble (also called a shambles) is a handmade device used by witches to detect or amplify magic. It can even be used for protection or to send a spell. The device itself is not magical. Shambles are like spectacles, they help you see, but don't see for you. 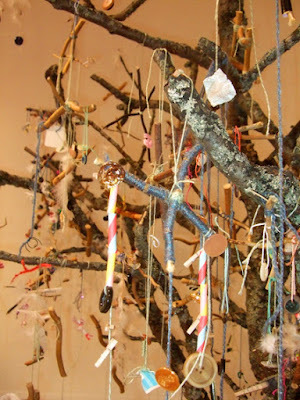 A conversant witch can assemble a shamble in a matter of seconds using stuff like strings, twigs, leaves, feathers, beads, coloured paper, an egg or even a beetle. The whole thing looks like a "cat's cradle", or some sort of nest made of rubbish. The ingredients are not really important, although the centre should contain a live ingredient (e.g. an egg or a beetle. The magic lies in its assembly and use, which is to catch the moment. "The way you tie the knots," said Miss Level, who was a Research Witch, "the way the string runs - the freshness of the egg, perhaps, and the moisture in the air - the tension of the twigs and the kind of things that you just happen to have in your pocket at that moment - even the way the wind is blowing. All these things make a kind of... of picture of the here-and-now when you move them right." Now, that might be fictional magic, but it makes sense to me. When I create or enchant an object for spells or rituals - whether for candle magic, poppet-making or anything else - I often use whatever I have to hand rather than going out and buying things specially. I also believe most of the magic comes from the witch herself and the energy raised. Physical things are mainly just a focus. The witch who trained me explained that all magic does is tweak the threads of the Web of Life. 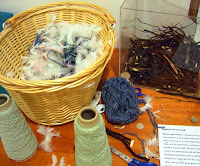 So, anything using string or wool is a perfect representation of that. The other objects you incorporate can have traditional symbolism - a four-leaf clover for luck, for example - or they can relate to the place, time and those who are with you. I only found a hair elastic in my pocket, which I wrapped around my twigs and tied to the tree. You might be able to see it about two-thirds of the way up in the photo at the top right. If you do make a shamble, please don't leave it tied to any living tree outdoors without permission of the tree and its human owner. Plastic and other artificial fibres don't rot away and can be a hazard to wildlife as well as eventually harming the tree itself. Another interesting fact is that the young witch Tiffany Aching had a shepherd's crown hanging from her shamble. This was used in the title of Terry Pratchett's last book. Shepherd's crowns are fossils of sea-urchins. Real-life witch Doreen Valiente also prized them highly. She collected them on walks in Sussex and made them into a necklace, which she wore when practising magic. I was doing some research and came across your blog. And to my surprise, I think you're the person who asked me at the museum whether they could take photos of the shambles for their blog! What a lovely coincidence if that's the case! I like the run down on how shambles work, there's so much we can take on from Pratchett's works, regardless if they're fictional. There's so much heart in them. I assumed their purpose (and inspiration) is meant to be similar to that of the ladder, and use left to the witch's interpretation. Yes, shambles do look a bit like some witches' ladders, don't they? I can see that they could serve the same function. Thanks so much for leaving a comment - how lovely that you remembered me asking if I could take a photo! I agree we can take a lot from Pratchett's writing. He definitely did his research - and, I believe, knew a few real life witches too.